I do agree with her. Just like her, I too do not believe in meal replacements and size zero figures. But some people like me who are on the heavier side, swinging between overweight and obese, must follow some simple diet principles. Some might say that Atkins or Dunkan diets work best, but they do not work for every one. And I do not support such diets. I can give you a few diet tips which I am following and is working for me. 2. Snack healthy : When you want to snack in between meals, I recommend to snack on fruits instead of a cookie(i know its very difficult to stay away from sweet treats, but you have to try), and opt for green tea instead of coffee. 3. Set realistic goals : You have a best friends wedding in a week or going on a beach vacation in a few days, and want to reduce around 10 kgs? Not possible. Set realistic goals and reduce slowly and steadily. This is healthy. 4. Keep yourself busy : Many people including me eat out of boredom, or when in a bad mood, or when I have fight with my husband(very rare, but the most worse situation, when I eat like a pig to reduce my frustation and anger 😀 ). I suggest to keep yourself busy in such situations. Go for a walk or talk to a friend. Avoid going towards the kitchen! 5. Stop comparing : Do not compare yourself with Keira Knightly or Kareena Kapoor. Your diet should help shape your body a little, not completely transform you into an other person. 6. Shopping : Now its getting interesting, isn’t it? I suggest to buy a pretty dress, one size smaller and work to fit in. This really works. Trust me! 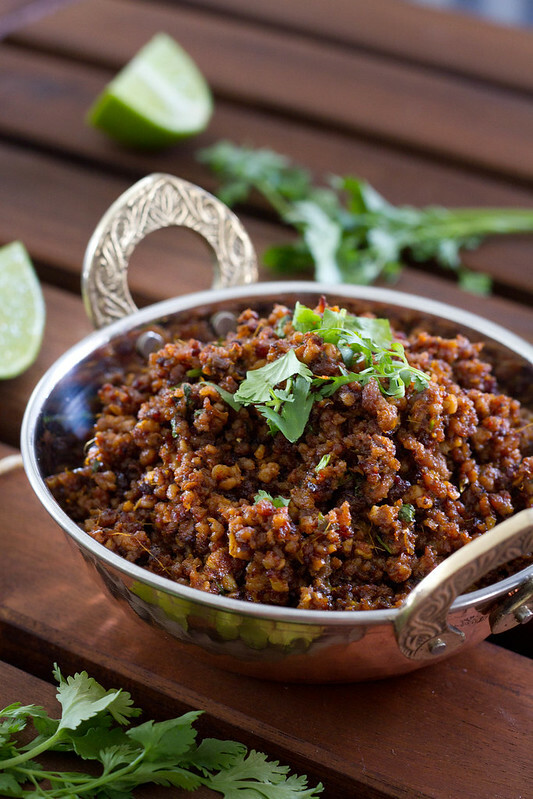 Now coming to the recipe, this kheema fry is healthy and delicious, more over easy to make. Add onions and green chili. Fry for few minutes. Add in ginger garlic paste. Fry till the raw smell disappears. Add in kheema,salt and red chili powder. Fry on medium heat stirring frequently to avoid burning or sticking to the pan. When almost done, add garam masala and chopped coriander leaves. Fry for few more minutes till done. You can use any meat for this, like ground chicken or even beef. Adjust green chillies and red chilli powder according to taste. If you do not want to keep stirring till done, turn to low heat, keep the lid and cook till done. Then fry till the water disappears. Now I am craving for some meat! Have you tried keema pulao ? It’s in my blog as a guest post from another blogger friend and it always come out yum! Yumm.. Kheema Pulao sounds delicious! I have to try it next time! Looks scrumptious! And more lovely pictures! 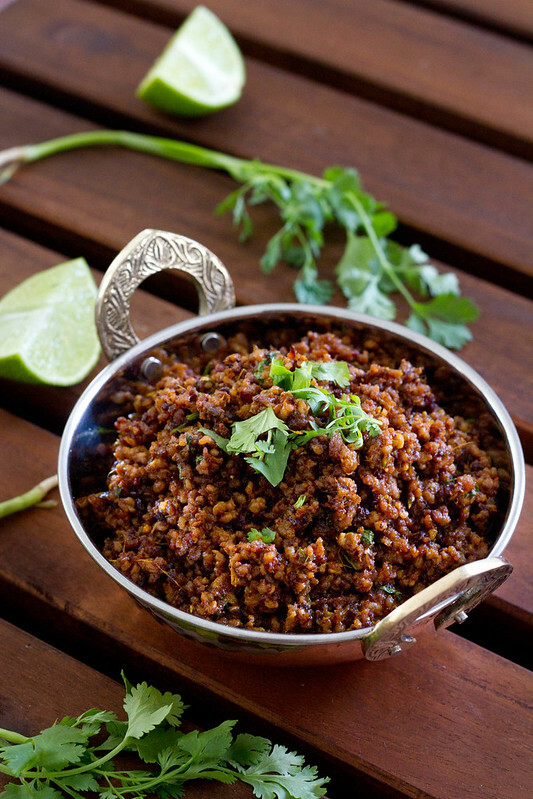 Spicy and yummy keema fry. I dont eat meat but this kheema fry reminded of those day when I use to eat a lot of meat :)……yummy! LOL – so true! I always find 1,000 excuses for not exercising but the older you get, the more you realise that it is the only way…! I am trying to go easy on the cabrs so this dish looks perfect! Gorgeous photos. What sharp and lovely pictures! Don’t think I’ve ever seen a kheema fry look this good. Kheema fry looks so good. If you are interested, you can link it my red meats event going on till July 31st. Thanks dear, for participating in red meats event! Could you please add a link to my announcement page.